Sarkar Movie: The most popular south Indian superstar Vijay’s long waited Sarkar movie is about to hit the screen for this Diwali tomorrow. The movie is scheduled to release worldwide and Sarkar producer and director earlier filed a case against Tamilrockers and other websites to not release the movie online. The court has already approved and issued an order to not release the movie online. 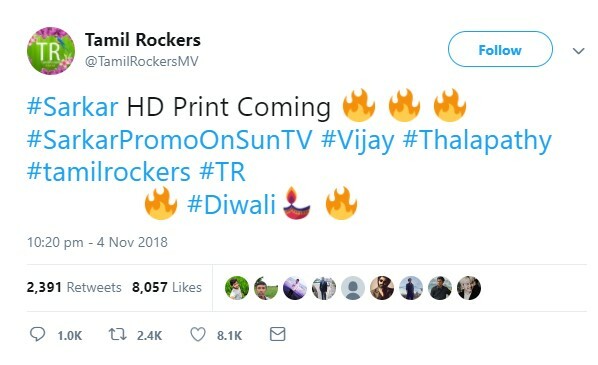 Now the most popular Tamil movies download website Tamilrockers came up with a tweet in which they mentioned Sarkar HD print will be released on their website as early as possible. This is an open threat and challenge to the Sarkar team. But still, there is no way that this will affect the box office collections as actor Vijay has fans all over the world. Most of them watch his movies at least two times on the very first day. On the other end, producer council asked all the theaters to watch carefully to catch the video recorders. The netizens on the other end criticize theaters stating the price of the ticket is more than Rs. 1000 in many cities. Even in the rural area, tickets are being sold for more than Rs. 200.